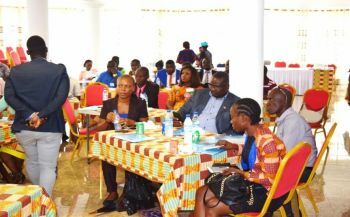 A 4-day capacity building workshop intended to strengthen the skills of private sector businesses to prepare and submit responsive bids when participating in public procurement tendering process, has ended in Monrovia, with a call for increased participation of Liberian owned businesses in public tenders. The workshop officially commenced on Tuesday, September 11and ended on September 14, 2018. Over 300 persons were invited to participate. The Chief Executive Officer of Public Procurement and Concessions Commission(PPCC), James Dorbor Jallah, made the call when he delivered the opening remarks at the start of the workshop held in the conference facility of Big Treat Entertainment in Sinkor. Mr. Jallah accentuated that unless businesses avail themselves to the procurement opportunities approved by the Government of Liberia for the growth of Liberian owned businesses, the dream of developing a powerful middle class in Liberia will become unattainable. He cautioned the participants against acts that are inimical to the generally accepted principles in public procurement. Also, Mr. Mulugeta Abebe, the Deputy Country Director for Operations of United Nations Development Program(UNDP), recounted the support of UNDP to the capacity strengthening efforts of PPCC and called on participants to take advantage of the training opportunity to upgrade their businesses. Mr. Abebe particularly mentioned the conduct of internationally accredited procurement chartered awards training program in Liberia and other procurement capacity building interventions funded by UNDP, as those that have made real impacts in Liberia’s public procurement implementation drive. He pledged his institution’s continued support to PPCC in its efforts to develop a vibrant private sector. UNDP is funding the initiative through its corruption prevention project, Strengthen Transparency Accountability Oversight and Participation (STAOP). The workshop was primarily designed to strengthen capacity of private sector businesses to meet eligibility requirements for entry to the PPCC’s Vendors Register; increase participation of private sector businesses in public procurement; understand the “dos and don’ts” of the bidding process for the procurement of Goods, Works and Services; and formalize the informal sector of the economy and create opportunities for female owned businesses. Experiences have so far shown that several Liberian owned businesses lack basic knowledge about public procurement tendering processes, thereby limiting their chances to participate in public tender or win public procurement contracts. Topics earmarked for presentation during the workshop include Online Vendors Registration & 25% SBA Procurement, Non-consulting Services and Framework Contracting, Bid Preparation and Tendering, Procurement of Goods, Works and Services.